These castles and the sites on these photographs are in the mountainous area where the Welsh kings built their strongholds.The northern areas of Wales were the last to fall to the Norman invaders. The mountainous region of Wales can be somewhat slow and difficult to travel(especially for us Americans accustomed to straight roads), but with one eye on the road and one on the beautiful scenery it is certainly well worth the effort. Only five miles from Blaunau Ffestiniog (which has the Llechwedd Quarry which hosts tours)is Dolwyddelan Castle. Dolwyddelan Castle was the birthplace of Llywelyn ap Iowerth(Llywelyn the Great) one the last of "the Prince of Wales". 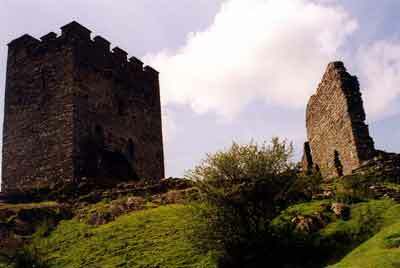 Dolbadarn Castle was built by Llywelyn the Great before 1230. 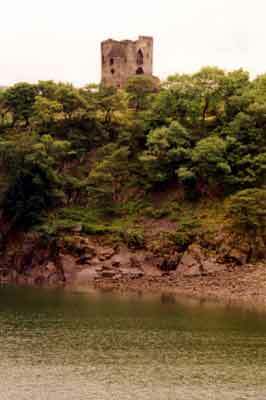 This castle protected a main route into North Wales through the Llanberis Pass. 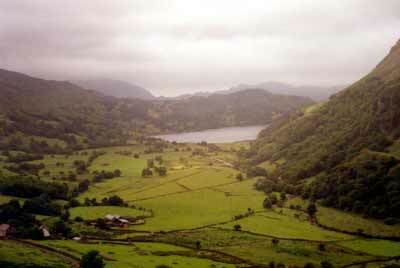 This photograph was taken from thee stronghold of Dolbadarn Castle. 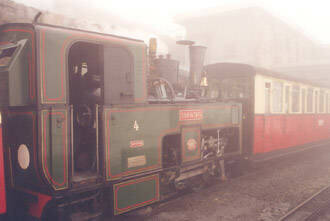 The Snowdon Railroad is a steam locomotive that travels on narrow gauge tracks to the summit of Mount Snowdon, the highest point in Wales and the second highest point in the United Kingdom.